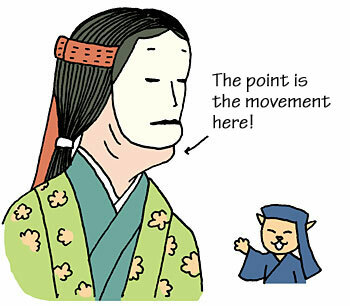 TRIVIA of Noh : Q15 : Why are Noh masks so small? | Home | Trivia | Q15 : Why are Noh masks so small? Why are Noh masks so small? It may seem strange to see a mask that doesn’t fully cover the actor's face, with the chin revealed. This is not because the Japanese people of long ago had such small faces; you will find that the mask best fits the actor when you see the chin. Other genres use masks big enough to cover the performers' faces, but this gives the impression of a disguise or the making of a fiction. If you see the chin, however, you sense a unity between the performer and the mask. The movement of the chin and the neck can give the wooden mask a range of subtle expressions. There are some performances in which the actors do not wear masks; these are called hitamen-mono (pieces without masks).